I had often wondered if I would ever be able to ride a bike. I never learnt as a child, and when I became an adult so many other distractions came along that my cycling goals were forgotten about. I’d had visions of the bicycle I wanted to own – colourful rainbow wheels, a floral basket, decorated with rickshaw-style motifs – that I would ride along the Thames path on sunny weekends. Trouble is, that was only half of the dream: in reality I still needed to learn how. In 2007 I sat on a bike for the first time in my life, and over three weeks of lessons I learnt the basics of balance. My cycling experience was short-lived though, since a work injury prevented me from looking over my shoulder, and I never went back. Fast-forward 10 years to 2017 and here I am, on a Sunday morning, sitting on a bicycle by the pictureseque Limehouse Basin. 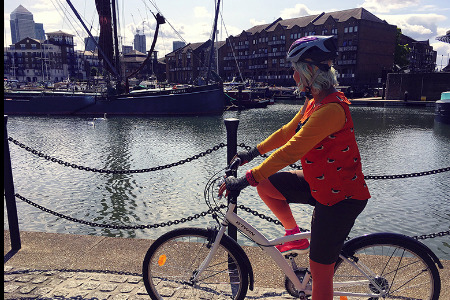 I’ve enrolled in a free 12-week women’s cycling course, funded by Cycling Grants London. I saw a poster at St Katharine’s Precinct and was attracted to the fact that bicycles were provided, the timing was doable, and it was free, so I had no excuses! At the first session I was so nervous. I had completely forgotten what to do, but our Cycle Instructor Shahanara had some positive advice about taking it slowly, and to keep trying to put my feet on the pedals before attempting to cycle. It was hard but I persevered and by the end of the class I was riding. We’re now over halfway through the course and I’m learning and developing confidence every week. I absolutely love the cycling part, but I’ve not yet mastered the art of changing gears, and I’m trying to build up the courage to take my hands off the bars to signal. So far that’s not happened, but I’m not giving up. Having a routine of going to class on Sunday morning, knowing I’m going to spend it in beautiful surroundings with friendly women who are are all so inspiring, is a highlight of my weekend. The sessions are aimed especially at Bangladeshi women, though the group is mixed, and everyone’s cycling ability is different. I love seeing the others all grow and develop as the weeks go on. The focus is on going at our own pace, with our instructor giving us individual tips so we can work on areas where we need to improve. I’d still call myself a beginner, but I’m learning new skills at every lesson. I absolutely cannot believe it’s happening: I can now cycle. Enrolling in these sessions has been life-changing. It’s very exciting and I’m so happy that I saw the poster and signed up. It’s the best decision I’ve made all year.